Villa Amore is a luxury, charming, lovely decorated 4 bedroom Villa 10 meters from the sea in a lovely calm bay in Vinisce and only 25 min from Split Airport. 2 spacious master bedrooms, beds 180 x 200 and sofa beds, with direct access to pool area and connecting private big bath rooms. Open area with wonderful kitchen including everything, even ice maker and wine fridge. Dining table for 8-10 people. Sofa group in front of open fireplace and 60' TV. Outside lovely veranda with lovely atmosphere and breath taking sea view including sofa group, dining table for 8-10 people and bbq corner. 2 bedrooms with beds 180x200 and shared bathroom. Pool area with heated pool 10x4 m and 6 loungers, access to the sea with small beach and 4 private loungers and sofa in the shadow. Also coffee table with sea view surrounded by citrus trees. 1 mooring in front of the house. Villa Amore is built in old stones and is absolutely charming both summer and winter. With the fully equipped kitchen and private pool and direct access to the sea you have all you need for a successful vacation. Maid and pool man comes every day and fresh bread can be ordered every morning. Also chef can be arranged for preparing traditional dalmatian food. Chauffeur by request. Villa Amore is situated only 800 meter from Vinisce village. It is a very nice walk by the sea and it is totally flat road. Vinisce has 5 nice restaurants that serve very good but not expensive food. You can also find a restaurant with traditional Croatian food and also very good fish & meat restaurant. In Vinisce you have also cafes and a ice-cream cafe with home made ice-cream. You also have post office and ATM-machine. About Vinisce: The sedate fishing town of Vinisce reclines lazily around a scenic horseshoe bay amid an area of great natural beauty. Verdant hills and secluded coves have led to the area becoming popular with hikers and kayakers. To make the most of a holiday to Vinisce, car hire is recommended. Other nearby places of interest include Split (35 minutes by car), the Krka waterfalls (45 minutes drive) and of course the many islands located throughout the region. We can arrange fishing trips and private taxi boats that takes you to the closets islands Drvenik, Solta, Brac, Hvar, where we also have excellent choices of restaurants. Dominik Andelic and I, Karin Elander have lived in Sweden all our lives before moving to Vinisce 2009 and then started our business by renting out our old renovated Stone houses, our Holiday Cottage 2011 and 2014 Little Holliday Cottage ! 2011 the Apartment-hotell with lovely spacious apartments was finished and we started renting out 2012. Now we are very happy to introduce wonderful Villa Zardin property number 3023206 which was finished 2012 and Villa Amore 2014 which now is for rent. WHY VINISCE ? Vinisce is a small quiet fishing town located in a beautiful bay of clear sea and untouched nature, only 17 km from Trogir. Vinišće was first mentioned in documents from the Trogir landed estates in 1272, even though the time of establishment has not been completely investigated. Judging by the Illyrian structures and remains of Roman constructions, it was inhabited even earlier. During the middle ages, the area was divided into a Diocese, the southern part along the sea, and Opatija - the northern inland part. The town has several beautiful churches. The church of the Blessed Virgin Mary (St. George) in Orihovica was established by the benedictions in 1272. Surrounding it is an old cemetery with stone sarcophagi. The Church of St. Antun Padovanski (Lady of Carmella) was built in the 18th century in Vinišće itself. The new parish church of The Heart of Jesus has a painting from an unknown painter from the 9th century. The church of St. Ivan on the Ploče cape was built in 1332 according to the legend where the Blessed Ivan Trogir miraculously saved people from Šibenik whose ship sunk. VinisceIn the surroundings there are several beautiful bays well known for their attractive pebble and sand beaches - Voluja, Ričevo Vrelo, Stari Trogir, Sićenica. Vinišće has several markets, restaurants and cafe bars. The place has a small marine, restaurants and cafés, and a short drive can get you to the city of Split, the cultural center of Dalmatia. Vinišće is a place intended first of all for lovers of quiet family vacations in private rooms, apartments, and houses and the destination is suitable for those who wish to have their privacy. Concerning activities, along with swimming and sunbathing, we can recommend surfing, sport and underwater fishing, and boat excursions. For those who love entertainment and night life, we recommend visiting nearby Trogir, Šibenik, Rogoznica, and Split. Service included: Daily house-keeping ( kitchen and dishes excluded) Kitchen Cleaning € 25,00 per day Private chef by request. Chauffeur by request. Minimum age limit for renters 30 years. The host and team quickly introduced us to every opportunity to see the surrounding area, but for the most part we chose to stay at the incredible villa, enjoying the sea, swim deck, and pool. The kitchen and outdoor barbeque allowed us to cook ourselves (stop at Kaufland in Trogir for most groceries, and take the bikes to the local markets and wharf for local fruit, fish, and last minute needs). A local shop had adult and child snorkel gear that we used extensively in the sea and pool - we watched an octopus hunting a few mornings! We had the team prepare dinner for us one night, a wonderful experience of local flavors. We utilized the bread service most days. The villa's architecture is wonderful, accommodating 3 generations of our large family in great comfort. The host even prepared some fishing poles for our children to use. We dream of visiting again! We love Vinisce and especially this property. Our family stayed next door for 10 days back in 2016 and loved it so much we decided to return for two weeks in 2018 and rent two adjacent villas. The location is a dream - Vinisce is off the beaten path so tourist crowds are non-existent but a 10 minute drive brings you to the main coastal road. We roamed the local area by car (Krka, Sibenik, Split, Olive Groves, Klis, etc) and by boat (Trogir, Marina, Rogoznica, Primosten, Solta, Blue Lagoon, Brac, Hvar) and by the end of the two weeks, were friendly with a number of locals in town. The villa is luxurious but comfortable. It has everything you need if you want to cook and stay home and access to great restaurants if you want to go out. We spent many hours enjoying the view on the balcony, hanging out by the pool, and lounging on the sundeck and dock by the water, using the bikes and kayaks and rental boats from Pika in town. Our group ranged in ages from 5 to 75 and the house accommodated everybody's needs. The service from the team is terrific. They are immediately responsive and helpful and took great care of us. It was nice to see they were the same people as 2016 and it was like returning to see old friends. It was really special to be there during part of Croatia's run to the World Cup finals - we just wish we could be there for the final match and participate in the electric atmosphere. We are overwhelmed about this wonderful review and we are both proud and happy to make your vacation so special for all your family! 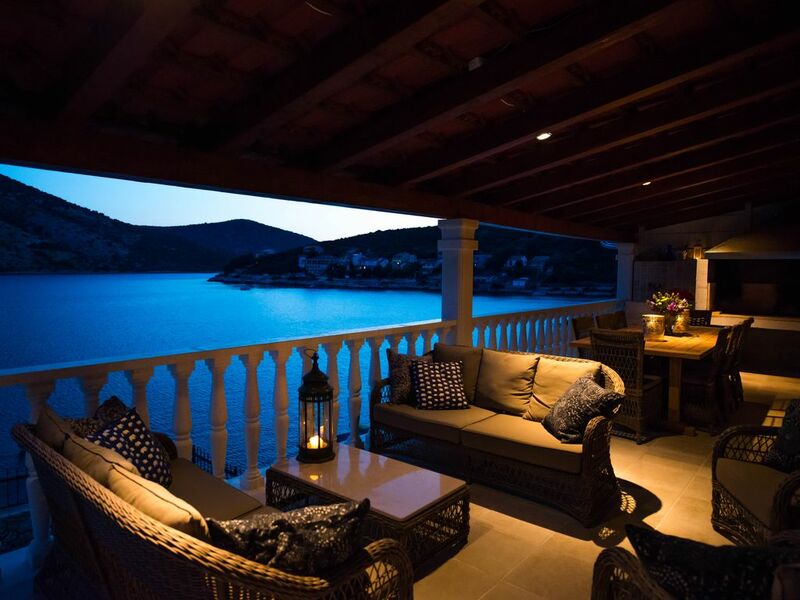 An amazing villa in an amazing location.Exceptionally well equipped and very spacious.Views out of the villa onto the bay are beautiful. The location allows for isolation if required but within easy reach of facilities when needed.Definate repeat visit when time allows. Perfect family property. Very well equipped & well run by the staff with lots of water based activities yet quiet & peaceful. Highly recommend Marino the private chef - a truly fantastic feast for our birthday guest! Perfect, perfect in every way! This lovely villa, beautifully appointed and situated, was so comfortable that we rarely strayed away. We were either in the pool, or in the beach cabana, or in the sea, or on the deep balcony eating, drinking, laughing. Only the delicious fish at the local tavernas -- a stroll along the water's edge away tempted us out of the fabulous lair. Beautiful Trogir has a prime spot on the Dalmatian Coast just 30 kilometers from Split and is one of the region's top vacation destinations. The town has a heady history that dates back to 380 BC, and it has been continuously inhabited by a succession of Greeks, Romans, Hungarians, and Venetians ever since. Declared a UNESCO World Heritage Site in 1997. Restoration projects undertaken in recent years have helped revitalize the numerous historic attractions, in particular Trogir's splendid Romanesque and Renaissance architecture, most of which is found within the 15th-century city walls. And just a few steps down from this delightful tangle of medieval streets is a pleasant waterfront promenade. From here, it's also easy to explore the islands of the Dalmatian Archipelago, and see the famous Blue Cave, on a speed boat day trip from Trogir. One of the top day trips from Trogir is to see Hvar Island and the Blue Cave. If you don't have a lot of time to explore the Dalmatian Archipelago, an organized tour like the five island speedboat tour is a great way to experience these stunning destinations. This tour isn't for the faint of heart, as it lasts 11 hours from start to finish, but you get your money's worth. And from Trogir, you'll visit Biševo Island and the coastal town of Komiža, explore the epic Blue Cave and Stiniva Bay, swim in the clear waters off Vis and Pakleni Islands, and check out Hvar Island's ancient architecture. At the very heart of Split there is Diocletian’s Palace, one of the best preserved Roman buildings in the world. Former emperor’s palace was built as a combination of luxury villa and Roman military camp, divided into four parts with two main streets. This rectangular building had four towers at its corners, four smaller towers on the walls and gates on each side. During centuries, Diocletian’s Palace was restored, and in its cellars today various cultural manifestations are held. Although today’s appearance is different from the original one, its contours are still visible and is therefore one of the most interesting buildings of this type in the world. All Dalmatian towns had turbulent history since the ancient times. In today’s Solin, only six kilometres from Split, there are remains of ancient town Salona. It was a metropolis of Roman province Dalmatia. At first, it was a costal stronghold and a harbour of Illyrian Delmats. In history, first mention of Salona dates back to 119 year BC, in times of wars between Illyrians and Romans. Today this archaeological site attracts visitors, primarily with remains of former arena and amphitheatre, palace and baths. Flowing for more than 60 miles (96 kilometers) from its source at Dinara on the Croatia–Bosnia and Herzegovina border all the way to the Adriatic Sea near Split, the Cetina River is a main player in Dalmatia’s adventure-sports scene. Its rushing rapids, waterfalls, and tunnels make it ideal for rafting and canyoning excursions. From €2195.00/week Terms of Payment: Initial Payment: 25% (when booking) Remaining payment. 42 days prior to arrival. Cancellation Policy: Booking payment is 25% of the total rental price and that is not refundable. Final payment 75% 42 days prior to arrival will not be refundable.